This year, North Korea’s regime has, notoriously, tested various types of ballistic missiles, and conducted nuclear tests. Some of those missiles have flown over the Japanese archipelago. Two have flown directly over Hokkaido, Japan’s largest northern island. With each missile launch, Japan’s J-Alert system was activated, which causes siren warnings, phone messages, and television alerts to be broadcast to the population. The Hokkaido Prefectural Government, in response to the threat of a North Korean missile strike, has conducted evacuation drills for Hokkaido residents. 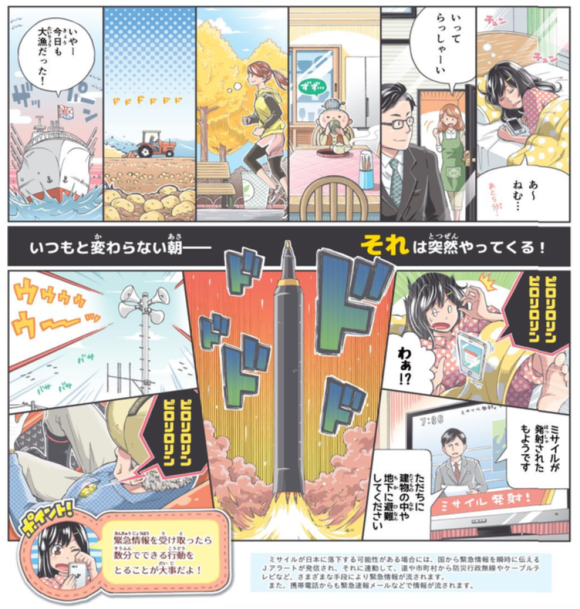 The Japan Times reports that the government has this month (October 2017) also issued a four page A-4 manga to assist Hokkaido residents on how to respond to a missile launch. 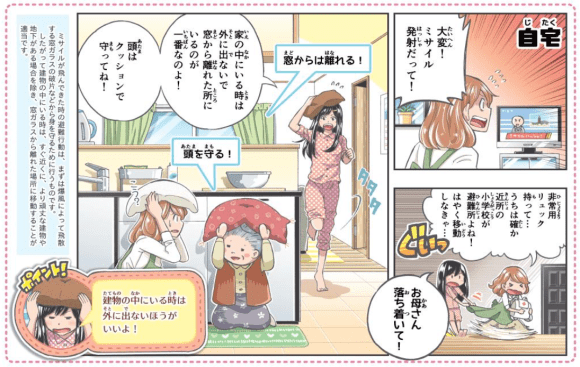 The manga begins with various people going about daily routines – farming, jogging, and sleeping. The next section describes how to respond if you are in a park – try to take refuge, for example, in a public toilet. Farmers are encouraged to take cover in fields and lie flat, covering their heads. If at sea, people are encouraged to find a shaded area and cover their heads. At home, residents are encouraged to stay inside, cover their heads with a cushion, and stay away from windows. Drivers are encouraged to park and hide behind walls, and keep away from cars, which contain combustible gasoline, and also avoid glass walls. The Chinese-character based alphabet, kanji, is accompanied by what is called “furigana” – a translation of complicated kanji into easier-to-read katakana for children. Usually this is done for very complicated manga. 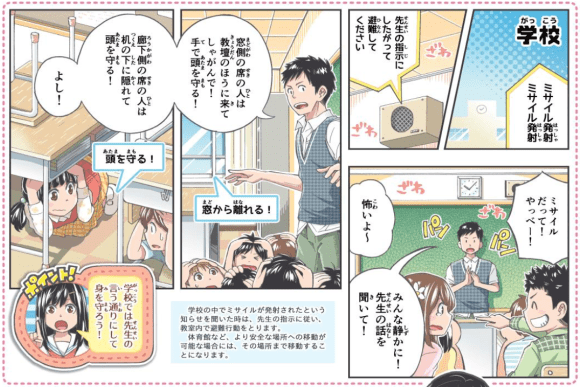 But furigana is used in this manga for even easy-to-read kanji such as “school” and “park”, suggesting that the demographic for the manga includes the very young. 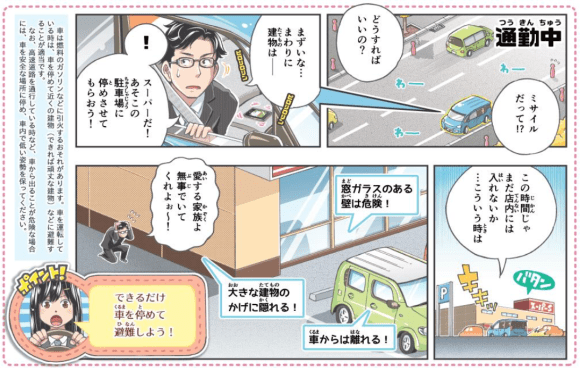 The world is in a sad state when we report on a children’s manga dedicated to recommendations on responding to the threat of a nuclear strike.